Well, basicly you say that fixed price contracts for software development are EVIL and should be avoided. Estimates destroying value? I read your friend’s experiences very differently – estimates being abused as cost commitments (without contingency), leading to all manner of problem behaviours. As a result, his move towards greater transparency means that clients have no basis to plan what they might have, when, for how much. No basis to decide whether to invest in the software. No accountability if he under-delivers. Transparency for him maybe – but not for the poor client footing the bill. There are lessons here. 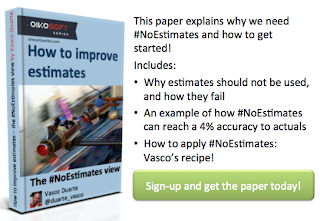 #NoEstimates isn’t one of them. I would not say that based on these stories. And whether fixed price projects are good or bad very much depends on what your business is. However, in this case the Fixed Price projects were part of the problem as they were a possible cause for the Sales team to behave like they did and negotiate down the estimate to achieve an “acceptable” price. In these stories estimates were used as a negotiation technique by both the sales team as well as the customer to “get more for less”. In practice destroying value (in the first case for the vendor, and for the customer in the second case). I don’t understand what you mean by transparency in your comment. In these stories there is no “move towards greater transparency”. Perhaps even the opposite happened, depending on your point of view. One way that would have increased the transparency in my view would be if the customer would define the investment ceiling and the scope of the project would be managed to meet that cost. In fact, many projects that require a specific release time-frame (any consumer software) would benefit from that discussion. In those cases the time acts as the cost multiplier and the scope is managed to meet the release date. Which is what the author of the story describes at the end of the post. Vasco, The number of stories of bad estimates, bad use of estimates, and project failure based on bad estimates and bad use abounds in all domains. In our defense and space SW business this is epidemic. 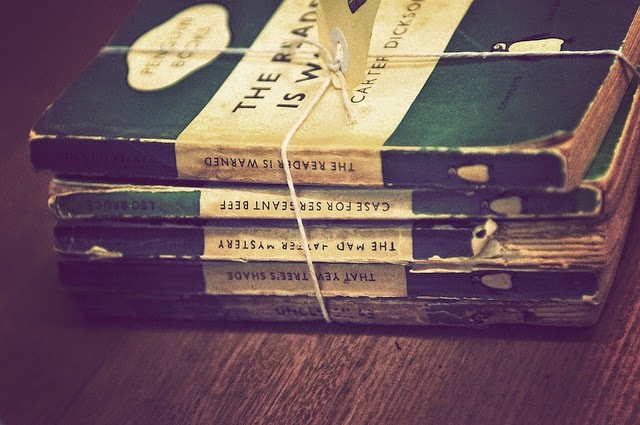 But the need to know the cost of any value still remains. I look forward to receiving your white paper on how you provide the business with rhe numbers needed to calculate ROI in your domain, since this is a “never ending” issue in all domains. Thanks for your reply Vasco. I entirely agree that use of estimates as a negotiating tool was destructive in these stories. 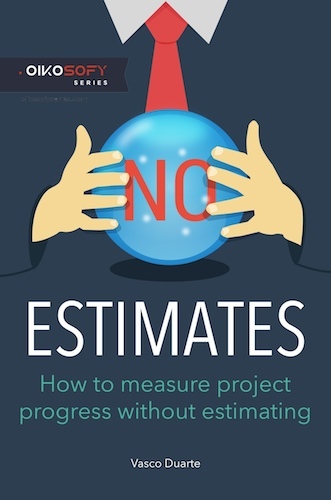 That’s not a case against estimates, it’s a case against abusive sales and procurement techniques, and against separating the practitioners – the people who have to do the work! 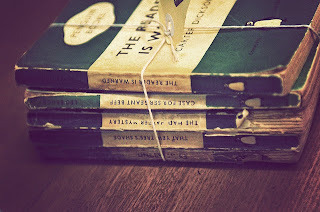 – from sales. It’s interesting that you propose investment-limited projects. That’s the approach of DSDM, at the ‘heavier’ end of the agile spectrum. However the customer still needs an idea of what they’ll get for their money – in DSDM they’ll definitely get all their Musts and probably a good range of their Shoulds and Coulds. “trust, communication and transparency” was the author’s final point. He saw the change positively. I see it much more ambivalently. Otherwise I should probably hold my tongue. I’m only chanelling Glen Alleman, who’s joined the conversation himself!